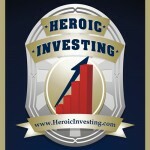 While the Heroic Investing blog and podcast are restricted by their nature to dribbling out a bit of income property investing education at a time, we also like to remind first responders looking for financial independence that it is possible to learn everything you need to know about how to create a lifetime of passive wealth in a single weekend. 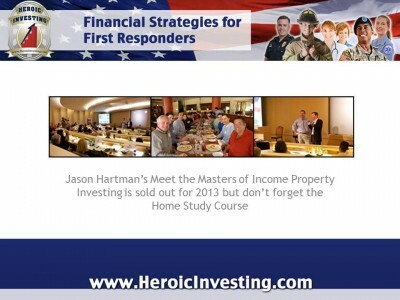 We’re only bragging a little when we say that Jason Hartman’s “Meet the Masters of Income Property Investing” educational event is becoming uncommonly popular. This upcoming gathering – scheduled for January 18-20, 2013, at the Hyatt Regency in Irvine, CA – has sold out with more than a month to go before our team of income property experts take the stage. We point out this fact not to rub it in your face but rather to encourage you to keep a sharp eye out for the next time it comes around, which will likely be sometime in January 2014. Is Meet the Masters all it’s cracked up to be? In a word, yes. 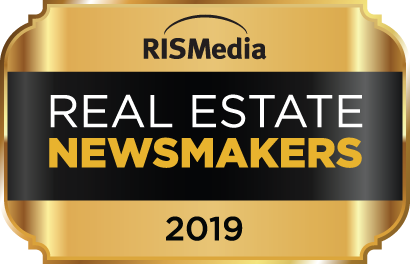 The honest truth is you’re never too old to build a real estate portfolio that provides complete financial independence and a comfortable retirement. It doesn’t matter how much or little you know about investing or what you’ve done in your life up to this point. The slate is blank when you arrive at Meet the Masters, and your future is ready to be written. Take a moment – what dreams come to mind? If you’re like most of the population, ranking near or at the top of that list is the desire to achieve financial independence and live a life where you, not a boss, dictate how you spend your time. That’s where Meet the Masters comes in. This is no high-dollar seminar that serves mainly as a funnel to get you to buy a more expensive product. This event is a two-day crash course in real estate investing – a self-contained unit, if you like to think of it that way. Everything you need to know in order to buy your first rental property will be taught. And if you have questions, simply raise your hand or corner the speaker after class. The only problem is, well, 2014 is a long time away and you’re ready to get started now. Luckily, Jason has prepared for that eventuality with the Masters Weekend Home Study Course, available as a digital download. Heck, you could get started studying within the next few minutes if you’re really motivated. The home course has the same great, actionable information as the upcoming live weekend, and the best part is that it never sells out. While we always encourage potential income property investors to attend a live Meet the Masters event if at all possible, the home study course can set you on the road to financial freedom also. First Responder Education – Take A Weekend In Irvine, California, On Us! Hurricane Sandy: A Hard Hit on the Housing Market?